A cool-season annual, winter field beans can tolerate frost but are killed by temperatures below -12 to -9C (10-15F). When using winter field beans to improve very poor soil, mixing a balanced organic fertiliser into the soil before planting will give better results. Poke holes in prepared seedbed and plant seeds 5 cm (2in) deep. 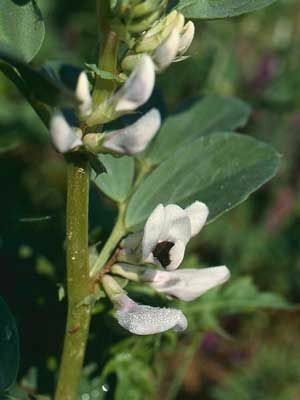 Winter field beans may be planted in late summer, or in very early spring. In milder areas they can be planted quite late into autumn. Primarily grown to increase soil nitrogen. Easier to turn under using hand tools compared to other green manures. Small-seeded varieties are best for green manure use. Winter field beans attract numerous beneficial insects. Do not grow them just before potatoes or other root crops, because field beans can host rootknot nematodes.